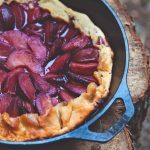 A quick and easy camping dessert, this autumn plum tart can be made right over the campfire using just your cast iron skillet. 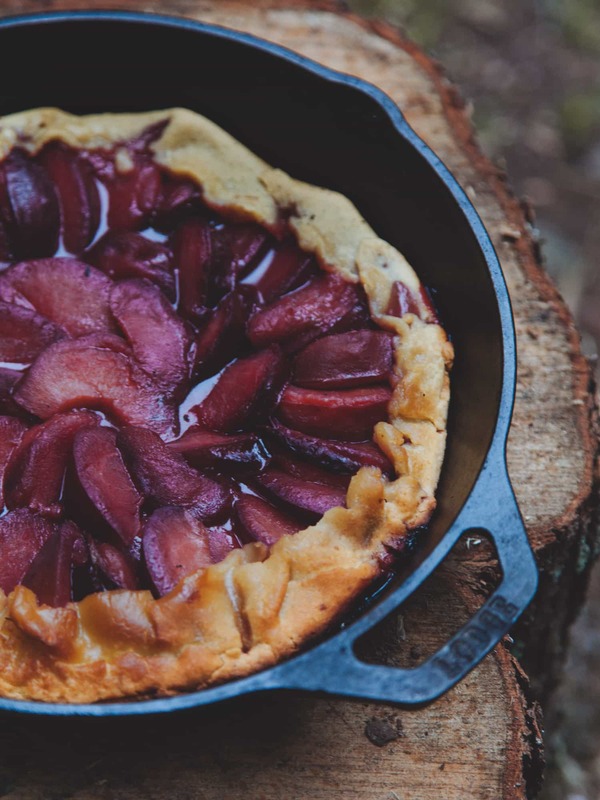 This delicious dessert was shared with us by FOTG contributor Emily Hlavac Green, whose life in New York City has not diminished her ability to get out and enjoy the outdoors. 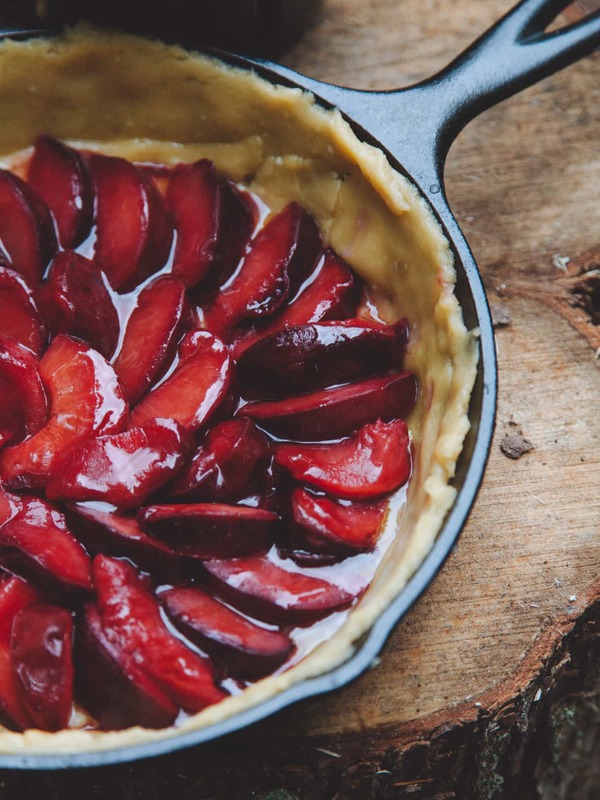 I mean, if we had a slice of this plum skillet tart and warm campfire waiting for us at the end of the day, we’d be making the extra effort get out there too. 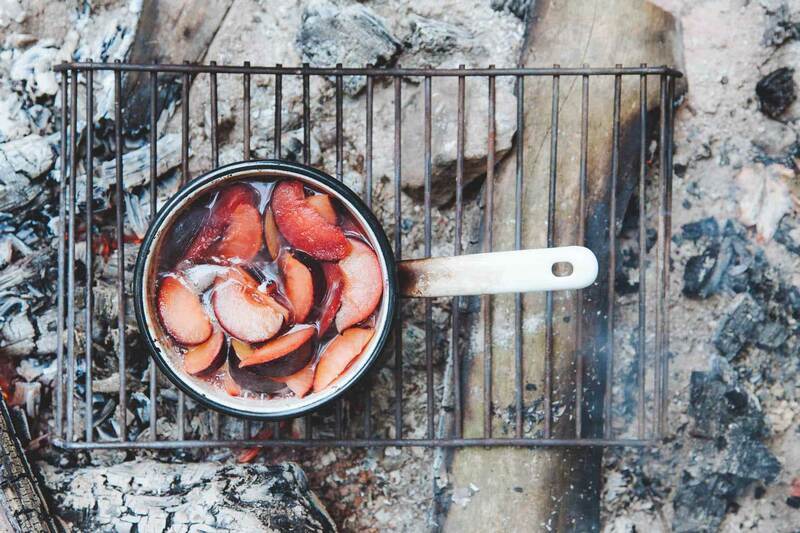 A juicy, not-too-sweet dessert which makes use of the late summer fruits and has plenty of rustic charm cooked over the campfire. This recipe goes hand in hand with my Plum & Rosemary Prosecco Spritz which uses your leftover plum juice in case you’re feeling a little thirsty. 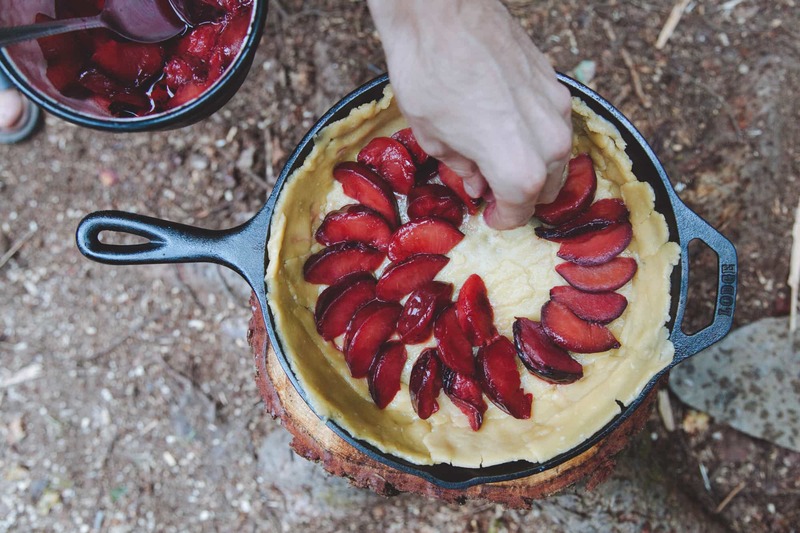 This beautiful plum tart cooks up right on your campfire. By preparing the pastry at home ahead of your trip, you can easily put this dessert together at the campsite. Put the flour and salt in a large bowl and add grated butter. Use your fingertips to rub the butter into the flour until you have a mixture that feels like coarse breadcrumbs with no large lumps. Using a knife, stir in just enough of the cold water to bind the dough together. Wrap the dough in saran wrap and chill for 10-15 minutes. Roll out a large piece of pastry between two sheets of baking paper about 1/4" (3mm) thick and large enough to cover the bottom and sides of your skillet. Roll the sheets and pastry up and refrigerate until ready to take camping. Slice plums into wedges and put into a saucepan with half the coconut sugar and water. Bring to a boil then let simmer over the campfire, stirring when needed to stop it sticking, adding more water if needed (but the plums should begin to release moisture as they cook). Once the plum pieces are soft, pour the liquid into another pan and save to make syrup for my Plum & Rosemary Prosecco Spritz. 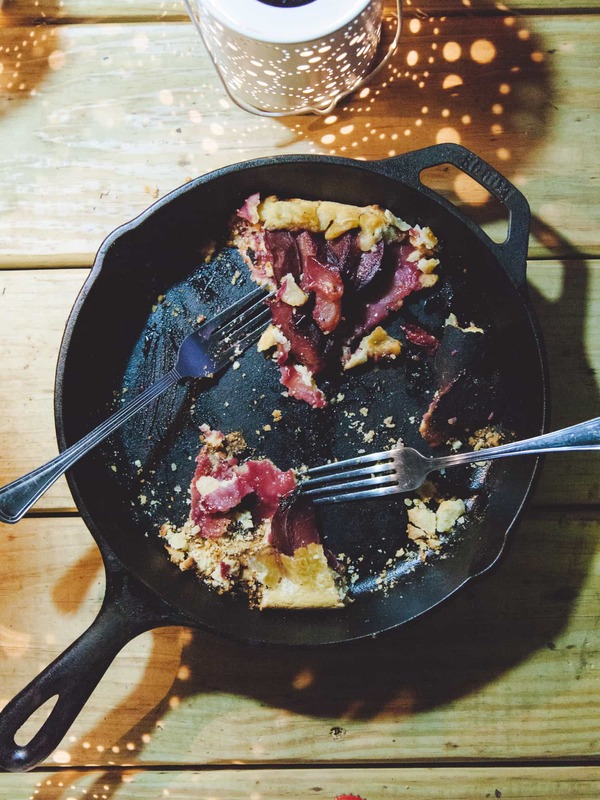 Unroll the sheet of pastry and lay into a skillet, cut to fit around the edges. Place plum pieces into the skillet, arranging in one flat layer. Drizzle with honey and fold edges in slightly. Cover with aluminum foil or lid so it is airtight, and place over a low fire, cook until edges begin to appear brown. 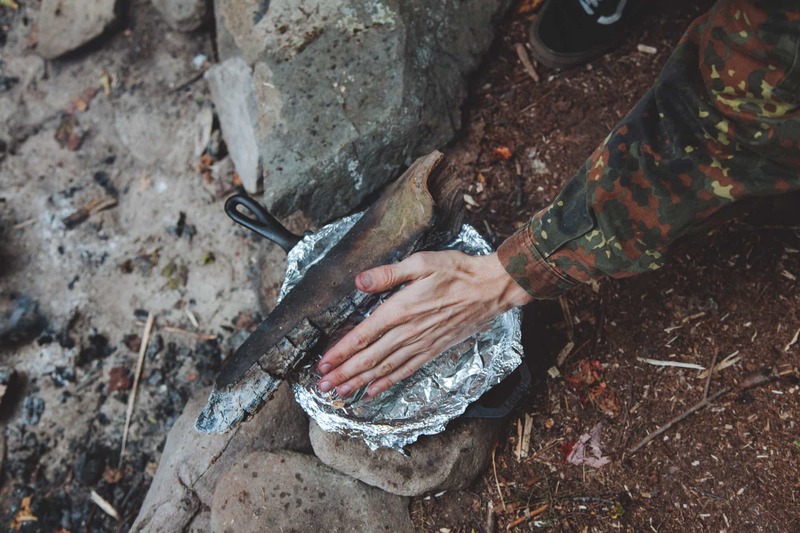 If you want the top pieces to brown, you can get resourceful on your cooking methods and lay glowing firewood over the top for a few minutes – caution though, this is only for the intrepid camper! Emily Hlavac Green is a photographer and artist from New Zealand, currently living in New York City. Getting outside, sleeping under the starts is something Emily and her partner-in-crime Jordan do most weekends. 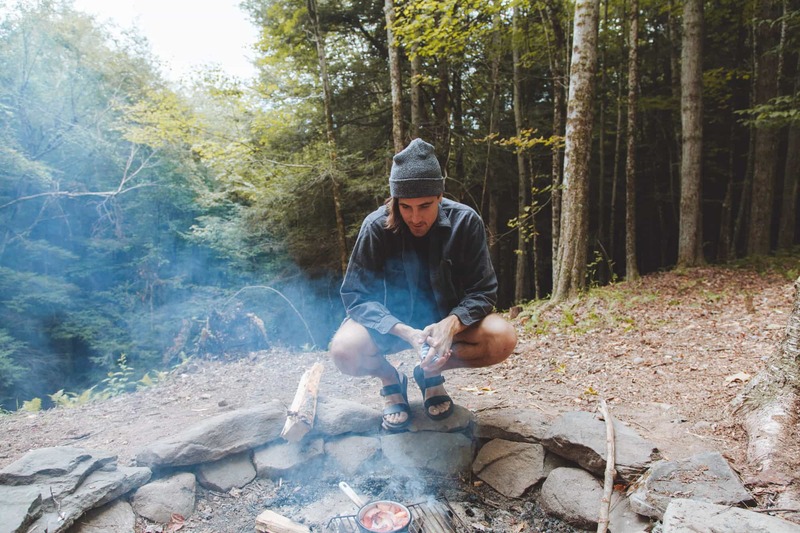 With a passion for being resourceful and only taking what they can carry on their backs, Emily’s goal is to to get creative with real, healthy and aspirational meals over a campfire. Oh, and there is always enough room for a bottle of wine.